• For rapid quantitative determination of cytotoxicity based on lactate dehydrogenase released into cell culture medium. Evaluation of toxic compounds, toxins, detergents, environmental pollutants and physical treatment on cell lysis. • Safe. Non-radioactive assay (cf. chromium release assay). • Fast. The whole procedure take 20 min. • Robust and amenable to HTS. Single reagent, "mix-incubate-measure" type assay. High-throughput assay in 96-well plates allows simultaneous processing tens of thousands of samples per day. • Lactate dehydrogenase (LDH) is an oxidoreductase which catalyzes the interconversion of lactate and pyruvate. Cytotoxic compounds often compromise cell membrane integrity by inducing apoptosis or necrosis. LDH is a stable cytosolic enzyme that upon membrane damage is released into the cellular environment. Therefore, LDH is often measured to evaluate the presence of tissue or cell damage. 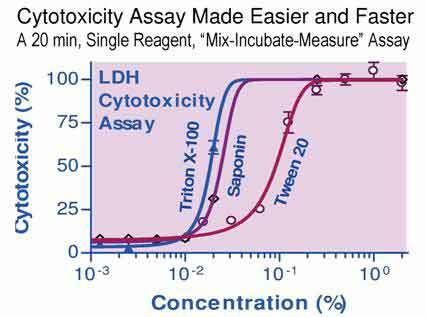 The colorimetric LDH release assay is a simple and robust method to assess cytotoxic effects on cells by measuring the activity of LDH in cell culture supernatant. The assay is based on the reduction of a tetrazolium salt to a formazan dye. 1. Does this assay kit work for a particular cell line? Yes, this kit works for all cell lines of any species. 2. Why is there no standard for this assay? This assay calculates the percentage of cell death. Therefore it uses the Total Lysis well and the No Treatment Control well (instead of a standard) to calculate the percentage of cell death in your samples. 3. How long do I need to incubate my test compounds with my cells? This depends entirely on your test compound and your experiment. The incubation can be as short as 5 minutes to as long as one day. The Triton-X 100 total lysis reagent acts immediately to lyse the cells and can be read immediately if so desired. 4. What is the best way to store the reagent? If you will be using the assay constantly every day, then store in the refridgerator. For long term storage, freeze the reagent at -20°C. 5. When does the assay expire? The shelf life of the assay is at least one year after receipt at -20°C.